The 10 Best Bakeries in Maryland! Nothing can make you smile like warm, hot bread or a fresh donut and a cup of coffee. Old neighborhood bakeries may have been replaced in much of the U.S. but in Maryland these gems are still thriving. Grocery store baked goods don’t compare to the smells and flavors you will find when entering any of our top 10 bakeries. Try them all and pick your favorite for yourself. Go early for the best selections but most of all—just go. You’ll have a better day because you did. With more than 65 years in business, Woodlea Bakery has served generations and is known for tasty recipes and baked goods like you remember them. Scratch-made daily, this is the classic neighborhood bakery that smells so fabulous, you don’t want to leave. Fresh bread, cakes, pies, cookies, pastries and more make this truly special. You go here to find out what bread is supposed to taste like, to buy a birthday cake for your best friend, or to grab a pastry when you’re feeling blue. Perfect for every day and all occasions, Woodlea Bakery is among the very best. For pie that you will never forget, you must head to South County Café in Deale. While they also serve lunch, the pie is why you really want to go here. Trust us—you will never view a store-bought pie the same way again. For elegant, scratch-made desserts in European style, visit Sweet Hearts Patisserie in Annapolis. You can try delicious macaroons, cupcakes, or order your wedding cake. Everything will taste incredible. A staple in Baltimore, Fenwick Bakery is an excellent place to go for scratch-made breads. Locals also go here for cake donuts, peach pastries, birthday cakes and more. During the holidays, you can order your pumpkin pie here and even non-pumpkin fans are likely to want a second serving. Fruit tarts, mousse cakes, and macaroons are a staple of this European-style bakery in Rockville. When you visit Stella’s Bakery, be sure to order your next birthday cake or a cake for any special occasion. They look beautiful but the real value is in the taste. Moist and delicious, you’ll never want to go somewhere else again. Located in Arbutus, Maryland, the Village Junction Bakery-Café is known for friendly service, the best donuts and coffee in the area, and pastries that will melt in your mouth. This is old-fashioned baking like you remember Grandma doing it. Muffins, rolls, cookies, cakes, pastries—you name it and they make it. They are open Wednesday through Saturday and you want to get there early for the best selection. A family-owned business, Lorenzo’s makes the best Italian cakes and pastries around. Come here for Italian cookies you can’t get elsewhere, fresh bread, sub rolls, donuts, a tasty blintz, sugar cookies and wedding cakes. When in Western Maryland, this is the bakery to visit. Combining a fabulous taste with artful design, Touché Touchet Bakery is known for visually stunning creations that you want to eat over and over again. Whether you want to most interesting sugar cookies or a cake that looks like it came from a magazine cover, this Columbia bakery will never disappoint. You can get creative and order their “hamburger” cake or try one of the most interesting cupcakes around. Either way, you will leave full and happy. Smith Island Cakes are famous world-over and they started on the Eastern Shore of Maryland. If you want a scratch-made Smith Island, you need to visit Classic Cakes where it all began—on the Eastern Shore. The owner, Stephanie, grew up on Smith Island so there is something special about enjoying a local tradition from a true local. This is a small community and they put pride in each cake or yummy pastry they create. A mother-daughter duo runs this bakery and it is truly unique. The pies are out of this world and the cupcakes are divine. What makes it a destination is that they have a gallery, frequent live music, wine and beer tastings and more. Essentially, you can stop by Baked Dessert Café for your morning cup of coffee and pastry, order a pie for Thanksgiving, or visit for date night or a girl’s night out. What’s consistent is the quality of baked goods and they never disappoint. You cannot beat an old-school bakery. You just can’t. 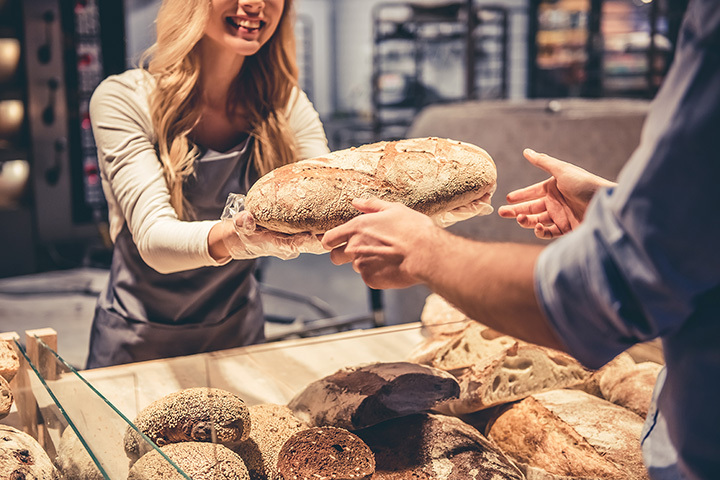 If it has been awhile since you bought a fresh loaf of bread, had a donut from a local shop, or took home a fresh pie for dessert—you are missing out. Try one of the bakeries on our list and you’ll never look at baked goods the same. View more Maryland Bakeries and Pastry Shops.